The first few trading days of 2017 have been quite busy for my options activity. Through just the first 3 trading days of 2017 I've made 14 different option moves across my accounts. That's a lot of activity even after accounting for my increased activity since rolling over my IRA. Five of those moves are put options opened last year that are now closed, four are put options that were opened, one is a call option that I sold and two of them are put options that were both opened and closed just this week. Since there's a lot to go over we'll just look 7 different options that are now closed and profits have been booked. If you're curious what option positions have been opened that I haven't yet been able to cover check out my option summary page. In my view Nike is trading on the high end of fair value which means it's close to where I'd like to buy shares, but not quite there. So I've been cycling through Nike put options quite regularly over the past couple months. The net profit worked out to $62.91 which is a 1.26% return based on the capital required to secure the put option. On an annualized basis that's a solid 25.7% return. The previous one was a solid profit, but it wasn't the only put option I had working on Nike. The net profit on this put option was $51.91 which is a solid 1.07% return based on the $4,850 required to secure the put option. On an annualized basis that's a solid 29.6% return. 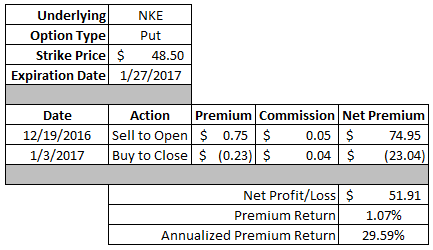 Over the past few months I've cycled through 4 different put options on Nike that have yielded a net profit of $206.74. Assuming I only had $5k or so earmarked for Nike that's over $2 per share lower that my cost basis could be reduced by. That's why I like put options as ways to enter into positions in companies I want to own. There was probably a little bit more juice to squeeze from this trade, but I decided to go on and take it off early since I was a bit overexposed via put options. Prior to closing this my cash requirements for this account was just over $100k. Even though many of these put options are at prices where I'd be happy to buy the companies I wasn't comfortable having over 70% of my capital committed at one time. The net profit on this put option worked out to $63.91 or 0.82% based on the $7,750 required to secure the put option via cash. On an annualized basis that works out to a 15.4% return. Much like Nike, Visa has been one of my go to companies to write puts on. Over the last few months I've closed out 3 different put options collecting a total of $246.73. I could effectively purchase shares today at $81, but have a cost basis of $78.50. Much like the Visa put option I left some profit potential on the table in order to get the position closed and reduce my capital exposed to put options. The net profit on this put option worked out to $102.91. Based on the $11,500 required to secure the put that works out to a 0.89%. On an annualized basis that's a 16.8% return. The next put option that I closed was written all the way back in early November. Realty Income has moved much higher since then giving me the chance to close out the position and use that cash that secured the put for better opportunities. The net profit via the option premium worked out to $89.91. Based on the $5,000 set aside to secure the put option that's a 1.80% return. On an annualized basis that's a 12.1% return. I'm pretty happy with this put option since I was able to capture 78% of the maximum profit in only 44% of the time to expiration. Since there wasn't any advantage to keeping the put option opened it made sense to close it out at a solid gain. I didn't even get a chance to get this one written up before I ended up closing the position. For some reason on Tuesday Becton, Dickinson's shares sold off pretty strongly early in trading. I couldn't find any real reason for the drop so I went ahead and sold the put option on BDX. Later in the morning on Tuesday the share price had recovered and Wednesday was a very boring day too. That allowed some of the implied volatility to work it's way out of the option market and bring the price of the contract down pretty significantly. The net profit on this put option worked out to $84.91. Based on the $15,500 required to secure the put option that's a 0.55% return. However, on an annualized basis that's a 171.2% return. Normally I wouldn't look to close out a position this quickly, but it felt about right because of the pretty large profit potential in just about 2 days. I was able to capture 35% of the premium by closing the position out after just 4% of the days. Typically I aim to keep 50%+ of the premium; however, if the market gives me an opportunity like this then I'll take it. Similar to the Becton, Dickinson put option above I didn't get a chance to get a write up for this option move before the position was closed out. Although 2 days seemed a bit too long of a holding period and with the CVS Health Corporation put option I both opened and closed the put option yesterday. Yep, it was a holding period of a few hours. Now that is definitely not something that I shoot for, but much like the previous put option if Mr. Market is going to give me the chance then I'd be foolish to not capitalize on it. The total profit from opening and closing the position worked out to $51.91. Based on the $7,850 that would have been required to secure the put option that's a 0.66% return. Calculating the annualized return on this move becomes much trickier since it was only open 4-5 hours. So I don't have a calculation for the annualized return; however, for some perspective if the option was closed tomorrow instead of today it would have been a 1,010.5% return. CVS goes ex-dividend on January 20th and is one of the few companies that I follow that is offering a good deal at the current prices. It's not quite as good as it was a couple months ago down in the low $70's, but the mid to upper $70's is still an attractive enough value prospect. With the ex-div date coming up I'll be hoping for some weakness on Friday to open up some upper $70's strike put options expiring January 13th. 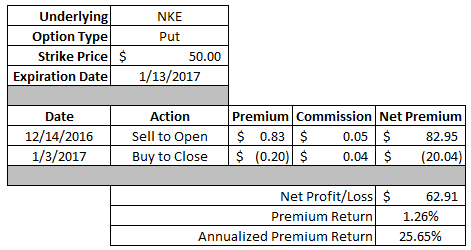 Thus far in January I've been able to generate $508.37 in profit via closed/expired options. It's obviously early into 2017, but in less than 1 month I've already collected around 50% of the premium that I did for 2016 across 4 months. Do you use put options as a way to get paid for your limit order to hit? Or do you prefer to keep your cash fully available to you? Good job JC. It is always nice to generate some extra income. 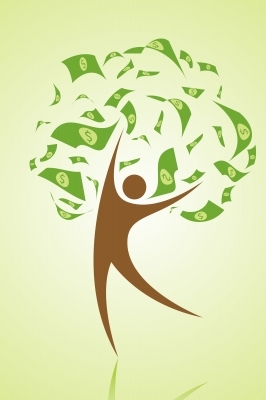 I am excited to see just how much extra income you will be able to generate this year. Keep up the good work and thanks for sharing. I rarely buy to close my options positions. I'm prolly leaving money on the table. But, I admit it, I'm lazy! Option income is looking good this month already, so you're certainly off to a great start! How much time are you spending on reviewing the option status on average? Are you planning on selling any further puts on Realty Income? I've been finding that REITs lately are good put-selling targets, and have positions on Realty Income and Ventas myself.